Harbhajan Singh pronunciation ▶ (Punjabi: ਹਰਭਜਨ ਸਿੰਘ, born: July 3, 1980 in Jalandhar, Punjab, India) has been an Indian cricketer and India's most successful off spin bowler. Harbhajan made his Test and One-Day International (ODI) debuts in early 1998. In the 2001 Border-Gavaskar Trophy team series victory over Australia, Harbhajan established himself as the team's leading spinner by taking 32 wickets and becoming the first Indian bowler to take a hat trick in Test cricket. Despite unremarkable Test performances in 2006, leading to speculation about his lack of loop and his waning value as a strike bowler, he remains India's first-choice ODI spinner. Harbhajan Singh has experienced more pressure than from just representing India on the cricket field. As a visible member of the Sikh faith, a minority faith in India, he feels the added pressure of representing his faith by choosing to wear his black turban while playing. He earned the nickname Turbanator, while playing outside India, for his ability to put out batters with his difficult-to-hit spin throw. Harbhajan suffered the greatest challenge to his goal of becoming a top cricket bowler in India when his father passed away suddenly. In traditional Punjabi Sikh society, the eldest son becomes responsible for the family upon the father's death. Fortunately for the game of cricket in India, he continued play, becoming an outstanding bowler with his unique spin style bowl. In a game that has little room for forgiveness when a player under performs, Harbhajan has regularly played at a championship level. Harbhajan had been born into a middle class Punjabi family, the only son of businessman Sardar Sardev Singh, who owned a ball bearing and valve factory. Growing up with five sisters, he stood in line to inherit the family business, but his father insisted that he concentrate on his cricket career and represent India. Charanjit Singh Bullar, Harbhajan's first coach, trained him as a batsman. He switched to spin bowling, after his coach's untimely death, under the tutelage of Davinder Arora. Arora credits Harbhajan's success to a work ethic that included a three hour training session in the morning, followed by another in the afternoon lasting from 3:00 p.m. until after sunset, using the headlights of a parked scooter to provide light. In a country that idolizes cricketers, Harbhajan's performances have brought him government accolades and lucrative sponsorships. Following his performance against Australia in 2001, the Government of Punjab awarded him Rs. 5 lakh, a plot of land, and an offer to become an honorary Deputy Superintendent of Punjab Police, which he declined. Harbhajan works also an employee of Indian Airlines, for whom he does promotions. One of his common nicknames, outside India, The Turbanator, deriving from his skill as a bowler in terminating the innings of the opposing team. As a Sikh, he wears a black turban whenever he plays. In 2005 Harbhajan had been the most recognized and commercially viable Indian cricketer after Sachin Tendulkar, in part due to his colorful personality and iconic turban. His signing for English county team Surrey in 2005, based at The Oval in London, has been partly attributed to his marketability. Harbhajan had generated a large personal following in the western London suburb of Southall, which boasts a majority Punjabi Sikh population, when he lived there in 1998 whilst training under Fred Titmus. A graph showing Singh's test career bowling statistics. 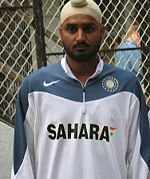 Harbhajan made his first-class cricket debut in late 1997, during the 1997-1998 Ranji Trophy season for Punjab cricket team. Playing in six matches, he took 18 wickets at an average of 22.5, ranking outside the top 20 in both wicket taking and averages. He played in only one Duleep Trophy match for North Zone, in which he took 5/131. Despite many bowlers having superior domestic performances, Harbhajan won the selection to make his Test debut in the Third Test against Australia in Bangalore, where he recorded the modest match figures of 2/136. Team leaders subsequently overlooked him for the ODI tournament that followed the Tests, involving Zimbabwe in addition to Australia. He won the nod for all group matches in the triangular tournament that followed soon after in Sharjah, where he made his ODI debut against New Zealand. The match referee fined and reprimanded Harbhajan in his first international series. His on-field behavior had been judged a breach the ICC Code of Conduct following an altercation with Ricky Ponting. Harbhajan lost an appointment to the team during a home triangular ODI tournament against Bangladesh and Kenya, only to receive a recall for the Singer Trophy in Sri Lanka, claiming eight wickets at an average of 24.1. After again being omitted for the Sahara Cup series against Pakistan in Toronto, Harbhajan took five wickets at an average of 22.6 on a tour to Zimbabwe, his last ODI appearances for India for more than two years. In all, he took 18 wickets at an average of 27.2 during the 1998. Harbhajan, retained in the Test team, took 5/106 in the only Test on the Zimbabwe tour. He enjoyed limited opportunities in the 1998-1999 season, playing in five of the seven Tests after being omitted for matches against New Zealand and Pakistan respectively. In all, he claimed 13 wickets at an average of 36.8. He played in the Ranji Trophy matches, claiming 27 wickets at an average of 24.59 in five matches, including his first five-wicket haul at first-class level. Harbhajan was overlooked for the ODI team for the whole season and missed selection for the 1999 Cricket World Cup. He managed to retain his Test position for the late 1999 home series against New Zealand, as India fielded a three pronged spin attack on dusty tracks, taking six wickets at an average of 32.66. 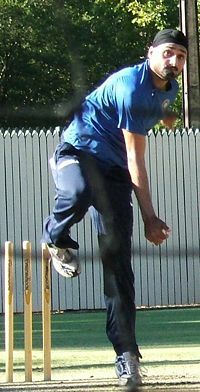 Harbhajan toured Australia in 1999/2000, as the second spinner. He missed play in the Tests, with India opting to field only Anil Kumble in the team. Upon returning to India in early 2000 for the latter stages of the season, Harbhajan regained a position in the Indian team, as Murali Kartik became Kumble's spinning partner. In mid-2000, Harbhajan won selection in the first group of trainees sent to the National Cricket Academy to study under Erapalli Prasanna and Srinivas Venkataraghavan, two off spin bowlers from the Indian spin quartet of the 1970s. His behavior earned expulsion on disciplinary grounds by director Hanumant Singh. His sponsorship job with Indian Airlines came under review as a result of his indiscipline. Harbhajan later admitted that he had been at fault earlier in his career. Following his run-ins with Indian cricket administrators, nothing indicated that Harbhajan had improved chances for national selection at the start of 2000/01. Despite Kumble being injured, Kartik, Sunil Joshi, and debutant Sarandeep Singh won the spin bowling duties in Test matches against Bangladesh and Zimbabwe on the subcontinent over Harbhajan. Having made little success in that phase of his international career, averaging 37.75 per wicket, and seemingly out of favor with selectors, Harbhajan faced a difficult decision. His father had recently died. The family's only son, Harbhajan felt obliged to support his mother and unmarried sisters. He contemplated quitting cricket and moving to the United States to drive trucks for a living. After more than 12 months without playing on the team, little foreshadowed the sudden rise that would occur in his cricketing career only a few months later. With Kumble injured during the home series in March 2001 against the visiting Australians, Harbhajan, whose previous best Test figures had been only 3/30, received a heavy responsibility. He had been selected to lead the spin attack against an Australian team which had set a world record with 15 consecutive Test victories, sought its first ever series victory on Indian soil since 1969. Harbhajan started well in the First Test in Mumbai, taking three quick wickets in a spell of 3/8, to reduce Australia to 99/5 in response to India's first innings of 176. A counter-attacking 197-run partnership between Matthew Hayden and Adam Gilchrist in just 32 overs, saw Harbhajan concede 103 runs from his last 17 overs, to end with 4/121. Despite being struck for many sixes into the crowd, Harbhajan still had his best statistical analysis at Test level. Australia proceeded to a crushing 10-wicket victory, their sixteenth consecutive Test victory in succession. Harbhajan celebrates becoming the first Indian to take a Test hat trick with captain Sourav Ganguly. With leading paceman Javagal Srinath ruled out of the series with a finger injury during the First Test, the teams met for the Second Test in Kolkata, with an even bigger burden on Harbhajan. Public opinion remained skeptical about India's chances of stopping Australia's winning streak, with former captain Bishan Bedi lamenting the demise of Indian cricket. Australia again seized control on the first day, having scored 193/1, with Hayden having struck Harbhajan out of the attack. Harbhajan fought back to reduce Australia to 252/7, taking five wickets in the final session, including Ricky Ponting, Gilchrist and Shane Warne in successive balls to become the first Indian to claim a Test hat-trick. After a prolonged wait for the third umpire to adjudicate whether Sadagoppan Ramesh had managed to catch Warne before the ball hit the ground, the near-capacity crowd at Eden Gardens erupted with his out. Harbhajan eventually finished with 7/123 as Australia had been bowled out for 445. India batted poorly, forced to follow-on, but a 376-run partnership between V. V. S. Laxman and Rahul Dravid, who batted together for an entire day, allowed India to set Australia an imposing target of 384 to win on the final day. Australia appeared to safely battle out the match for a draw, until losing 7/56 in the final session, collapsing from 166/3 to be bowled out for 212. Harbhajan claimed four of the wickets, to finish with 6/73 for the innings and a match tally of 13/196. India ended Australia's 16-match world record winning streak, and became only the third team to win a Test after being forced to follow on (Australia having lost all three of those matches). The teams arrived in Chennai for the deciding Third Test, and Australia's batsmen again seized control after winning the toss, reaching 340/3 on the second morning. Then, Australian captain Steve Waugh padded away a delivery from Harbhajan. The ball spun back into Waugh's stumps, who pushed the ball away with his glove, becoming only the sixth batsman in Tests to be given out "handled the ball." Waugh's dismissal instigated another Australian batting collapse, losing six wickets for 51 runs to be bowled out for 391, with Harbhajan taking all six in a spell of 6/26, to finish with 7/133. After India's batsmen gained a first-innings lead of 110, the Australian batsmen again failed to cope with Harbhajan in the second innings, who took 8/84 to end with match figures of 15/217. India headed for an easy victory at 101/2 chasing 155, before losing 6/50 to be 151/8. Perhaps fittingly, Harbhajan walked to the crease, and struck the winning runs. Harbhajan's Test success saw him recalled to the ODI team after more than two years. He failed to reproduce his Test form against Australia, managing only four wickets at an average of 59.25, and a cameo batting performance of 46 runs from 34 balls, including three sixes. Selectors dropped him from the ODI team during a subsequent triangular tournament in Zimbabwe in 2001 after only managing two wickets at 69. Harbhajan failed to maintain his form in the Test series, taking eight wickets at 29.1 in the series against Zimbabwe, but managed to post his first Test half-century, reaching 66 in the First Test in Bulawayo. The Indians subsequently toured Sri Lanka in mid-2001, enjoying spinning wickets similar to those in India. Harbhajan managed to establish himself in the ODI team with eleven wickets at 21, but his Test form deteriorated further, yielding only four wickets at 73, while Sri Lankan spinner Muttiah Muralitharan won man of the series honors with 23 at 19, in a contest between the world's two leading off-spinners. Harbhajan lost a place the Indian team in favor of Kumble on the following tour of South Africa, only playing in the later matches when India fielded two spinners. Harbhajan continued to average 20 in the ODI format, winning his first man of the match award in the ODI form in an ODI against South Africa in Bloemfontein. His disciplinary problems continued when numbering among Indian players fined and receiving a suspended one-match suspension for dissent and attempting to intimidate the umpire by over-appealing. Harbhajan's Test fortunes improved immediately upon the start of the 2001-2002 international season in India. Playing in his first international match at his home ground in Mohali, Punjab, Harbhajan took match figures of 7/110, including 5/51 in the first innings, to help India win the First Test by ten wickets against the touring English team. He continued his steady form throughout the series with another five-wicket haul in the Second Test in Ahmedabad, to end with thirteen wickets at 24.53 for the series. Harbhajan's good form persisted in the matches against Zimbabwe, taking 12 wickets at 19.66. His 2/70 and 6/62 in the second Test in Delhi saw him named man of the match in a Test for the second time in his career. He also performed strongly in the ODIs during the Indian season, taking 20 wickets at 19.75 in ten matches and taking his first five-wicket haul in ODIs. Harbhajan's overseas difficulties returned during the tour of the West Indies in mid-2002. He injured his shoulder while fielding in a tour match, forcing him to miss the First Test in Guyana. After taking only six wickets at 38 upon his return to the team for the Second Test, selectors dropped him for the Fourth Test, but received a recall for the Fifth Test at Sabina Park, after Kumble suffered an injury. Despite taking improved figures of 8/180, India fell in defeat. He claimed three wickets in the three-match ODI series at 33. Despite his performance at Sabina Park, Harbhajan lost his spot on the team again when Kumble returned for the First Test on the tour to England at Lord's. India's coach John Wright later admitted that that had been a mistake. Harbhajan returned for the final three Tests with moderate success, taking 12 wickets at 34.16, as well as managing his second Test half-century of 54 at Trent Bridge in the Second Test. The 2002 ICC Champions Trophy in Sri Lanka at the end of the tour brought moderate results with six wickets at 30.66, and a best of 3/27 in the washed out final against the host nation. 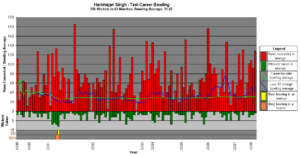 As in the previous season, Harbhajan's return to Indian soil coincided with an improvement in results. He took 8/85 in an innings victory at Mumbai in the First Test against the West Indies, and then contributed match figures of 7/135 and 37 in an eight-wicket victory in Chennai which saw him named man of the match. A haul of 5/115 in the Third Test at Calcutta notched the best in a high scoring match, and with 20 wickets at 16.75, Harbhajan won the man of the series honors. He failed to keep that level of performance in the ODI format, taking only six wickets at 50.16 against the same team. Harbhajan took only five wickets in the subsequent Test tour to New Zealand, in a series where five pace bowlers averaged less than 20 on seaming tracks. Harbhajan had a mixed tournament at the 2003 Cricket World Cup, taking 11 wickets at 30.45. He had been the first-choice spinner and played in all matches but one, being dropped against arch-rivals Pakistan. His rival, Kumble, only played in three matches. Harbhajan had been the only Indian bowler to take a wicket in the defeat to Australia in the final, taking 2/49. He stood as the fourth leading wicket taker for India overall and his tournament bowling average proved worse than those of Zaheer Khan, Ashish Nehra and Javagal Srinath. He finished the season with six wickets at 14 in an ODI tournament in Bangladesh, where he received a fine for abusing an umpire. After experiencing pains in his spinning finger during the World Cup, Harbhajan had been scheduled to undergo surgery in mid-2003 in Australia but delayed the surgery as he sought to play through the pain. He underwent physiotherapy in lieu of surgery, declared fit for a two-match Test series against New Zealand in late 2003. His performance proved substantially worse than his previous displays on Indian soil, taking only six wickets at an average of 50. Aside from his debut series, he turned in his worst series bowling average on Indian soil. Despite an ODI series, in which he managed only four wickets at 40.5, the Indian team attempted to manage his injury rather than have his finger operated on, and took him on the 2003-2004 tour of Australia. After an ineffective 1/169 in the First Test at Brisbane, his injury deteriorated and he underwent major finger surgery late in the year 2003. Kumble replaced him and took 24 wickets in the remaining three Tests. Kumble bowled India to victory in the following Test against Pakistan in Multan, taking 6/71 to reclaim his position as the No.1 spinner. After a seven-month layoff, Harbhajan returned to represent India in ODIs in the Asia Cup in July 2004, where he took four wickets at 39.75 in four matches. His performance improved markedly on the tour to England for an ODI series against England and the 2004 ICC Champions Trophy, taking eight wickets at 14 and hitting as an unbeaten 41 against England at The Oval. Harbhajan made his Test return against Australia, who again sought their first series win on Indian soil since 1969 in the late 2004 home series. Harbhajan took 5/146 in the first innings and 6/78 in the second innings in addition to making a run out to reduce Australia from 103/3 to 228 all out. Despite that, India required 457 in their second innings to win, slumping to 125/8 before Harbhajan (42) and Irfan Pathan helped India to reach 239, still a 217-run loss. Harbhajan proved less effective in the drawn Second Test in Chennai, with match figures of 5/198, and withdrew from the Third Test in Nagpur due to illness. Australia won the match, clinching the series. Harbhajan returned for the final Test. After failing to take a wicket in the first innings, he claimed 5/29 in the second to help India bowl Australia out for 93 and claim a dramatic 14-run victory. Harbhajan ended the series with 21 wickets at 24. A Test series in India against South Africa followed, with Harbhajan taking match figures of 4/166 in the First Test in Kanpur, before producing a man of the match performance in the Second Test in Calcutta to lead India to a 1-0 series win. After taking 2/54 in the first innings, he took 6/78 in the second, including South Africa's first five batsman to set up a successful run-chase of 117. Harbhajan emerged as the leading wicket-taker for the series, with 13 at an average of 23.61. He ended 2004 with a quiet tour of Bangladesh, scoring a 47 and taking four wickets at 41.75 in two Tests and one wicket at 94 in two ODIs. He had a relatively light workload, bowling only 47.4 overs, as Irfan Pathan frequently scythed through the Bangladeshi batsmen with the new ball, taking three five-wicket hauls. His performance in Bangladesh saw him dropped for the First Test in the early 2005 series against Pakistan on his home ground in Mohali, with Kumble being the only spinner selected on the pace-friendly surface. Recalled for the Second Test in Calcutta, he took match figures of 4/145 in an Indian victory. Despite taking 6/152 in a marathon 51-over spell in the first innings of the Third Test in Bangalore, Pakistan won the match to level the series. He finished the series with 10 wickets at 33.2. His performance in the subsequent ODI series proved even worse, managing only three wickets at 73.66 in five matches. In spite of the poor end to the season, his performance in the year since finger surgery saw him nominated for the 2005 ICC Test Player of the Year. Harbhajan spent the international off-season playing for Surrey in English county cricket, citing the improvement that other international players had gained from such an experience. Harbhajan's first outings under newly appointed coach Greg Chappell came at the Indian Oil Cup in Sri Lanka in August 2005. He took five wickets at 31.4 in four matches, but went wicketless in the final won by the host nation. A tour of Zimbabwe followed, marred by tension between the new coach and Indian captain Ganguly. Harbhajan played in five matches in the Videocon Tri-Series involving Zimbabwe and New Zealand, managing only two wickets at 94, both of them against an inexperienced Zimbabwe team crippled by a mass exodus of white players from the Mugabe regime. Harbhajan had a quiet Test series against Zimbabwe, taking six wickets at 31. He bowled only 58 overs, as the majority of the Zimbabwean batsmen had been removed after being unable to cope with Pathan's swing, likened to "Frisbees at high speed." He managed to claim his 200th Test wicket in the First Test, and in doing so became the second youngest player to reach the mark after Kapil Dev. Harbhajan's batting enjoyed an exceptionally aggressive 18-ball innings in the First Test in Bulawayo, where he struck four fours and three sixes in a cameo innings of 37. Harbhajan's difficulties compounded when he earned the ire of cricket authorities by publicly attacking Chappell and defending Ganguly after the team returned to India. He claimed that Chappell had used "double standards" and instilled "fear and insecurity" into the team. The Punjab Cricket Association called him to explain his actions but he escaped punishment after offering an apology. In early 2006, Harbhajan changed his stance publicly, praising Chappell for the team's improved form, stating "He has great knowledge about the game and it has been a very successful year for us under him. He has lifted our team to great heights". Harbhajan came under pressure to perform when Sri Lanka toured India in late 2005 following his attack on Chappell and the replacement of Ganguly, who had frequently supported him during previous career difficulties, with new captain Rahul Dravid. In addition, his home ODI form had been poor in the previous three years, managing only 12 wickets at 56 in 16 matches, with an economy rate of 4.8. He responded by claiming 3/35 in the first ODI in Nagpur after Sri Lanka had raced to 50 in just 6.3 overs. The Sri Lankan batsman hit the Indian fast bowlers out of the attack, scoring 74 runs in the first 10 overs and forcing Dravid to delay the Power Play and introduce Harbhajan. That sparked a collapse, with 4 wickets taken for 14 runs, resulting in a 152-run Indian victory. Harbhajan aggregated six wickets at 26 in the first four matches, at a low economy rate of 3.43, with a series of performances noted for skillful variations in pace and flight, helping India gain an unassailable 4-0 series lead. He subsequently rested for the fifth ODI, and ended the series as the most economical bowler. He put on another strong personal performance in the first ODI of the following series against South Africa in Hyderabad, where he struck an aggressive unbeaten 37 from 17 balls, including two sixes, to help India recover to 249/9, before taking 1/35 from his 10 overs. He failed to prevent an Indian loss, and received a fine after pointing Ashwell Prince to the pavilion after dismissing him. Harbhajan ended the series with five wickets at 27.4, and again earned India's most economical bowler. 2005 ended with a three Test series against Sri Lanka. After the first match in Chennai washed out due to rain, Harbhajan took match figures of 4/137 in as India took a 1-0 series lead. He finished the calendar year with a man of the match performance in Ahmedabad, which saw India seal a 2-0 series victory with a 259 run victory. He took 7/62 in the first innings, including six of Sri Lanka's top eight batsmen. A middle-order batting collapse, with six wickets falling for 82 runs, allowed India to take a 193-run first innings lead. Harbhajan later contributed an aggressive innings of 40 not out from 51 balls, in an unbroken 49 run final-wicket partnership with Kumble in the second innings, their display of unorthodox hitting stretching India's lead to 508 runs. His prospects of a half-century cut short with a declaration from acting captain Virender Sehwag, but he received compensation with opening the bowling, as Sehwag employed a novel tactic of assigning the new ball to a spinner. He took 3/79 to finish with match figures of 10/141, ending the year on a high note after he had been embroiled in the leadership struggle only three months earlier. 2006 began with Harbhajan's first tour to arch rivals Pakistan. The First Test proved a high scoring draw held in Lahore, where Harbhajan recorded his worst ever Test figures of 0/176 in a match with 1,089 runs scored for loss of just eight wickets. In a match where many batting records fell, Harbhajan had been hit for 27 runs in one over by Shahid Afridi, just one short of the world record. The second Test in Faisalabad resulted in another high scoring draw, with the aggregate runs being the fourth highest in Test history. Harbhajan took 0/101 and 0/78. His 81 overs in the series marked the fourth highest amount of overs in any Test series without taking a wicket. When given the opportunity to make use of the batting surface, he managed a brisk 38, including two sixes. Harbhajan missed selection for the Third Test in Karachi, where a green pitch promised to favor seam bowling, and Kumble only played spinner used. After sustaining an injury, Harbhajan went home during the subsequent ODI series without playing a match, ending his tour without taking a wicket. A return to Indian soil for the Test series against England failed to ease Harbhajan's wicket-taking difficulties. He managed match figures of 2/172 in the drawn First Test in Nagpur, and 1/83 in the Second Test in Mohali, where he hit 36 runs, helping India to a first innings lead. Despite taking 3/89 and 2/40 in the Third Test in Mumbai, Harbhajan ended the series with eight wickets at an average of 48, nearly twice his career average on Indian soil. Harbhajan's ODI form remained strong, as he top-scored with 37 and then took 5/31 in a man of the match performance in the first ODI against England in Delhi, sparking a collapse of 7/47 which secured a 39-run victory. He ended the series with 12 wickets at 15.58, and topped the wicket-taking list, as well as having the best bowling average and economy rate. Harbhajan failed to maintain his ODI form on the tour to the West Indies, where he managed three wickets at 64 in five matches. He missed selection for the Test team in opening two Tests as India opted to use three pace bowlers and Anil Kumble, scrapping the five-bowler strategy used since early 2006. Harbhajan, recalled for the Third Test in St Kitts after the pace attack, failed to dismiss the West Indian batsmen, with West Indies captain Brian Lara stating that his team would have been lucky to draw the Second Test had Harbhajan been playing. In a drawn match, Harbhajan claimed the leading match figures of 6/186, as well as contributing an unbeaten 38. Harbhajan's 5/13 in the first innings in the Fourth Test saw the hosts lose their last six wickets for 23, to give India a 97 run first innings lead. India went on secure a victory in a low scoring match in three days and win the series 1-0. India won its first series victory in the Caribbean in 35 years, with Harbhajan contributing 11 wickets at 24. The 2006-2007 season began with the DLF Cup in Malaysia, Harbhajan made a good start to the season, taking six wickets at 17.5 in four matches. Winning man of the match against the West Indies, scoring 37 in a 78-run partnership to push India to 162, he took 3/35 to secure a 16-run victory. Unable to maintain his form in the 2006 ICC Champions Trophy held in India, he managed only two wickets at 51.5 and saving his worst performance of 0/49 in the final group match against Australia on his home ground in Punjab. The tour of South Africa in late 2006 saw even less success, taking only one wicket in three ODI matches while conceding 161 runs. He finished the year watching from the sidelines as India fielded Kumble as the only spinner in the three Test series. Apart from the injury hit 2003, Harbhajan had his least productive year in Test cricket since he became a regular team member in 2001, managing only 19 wickets at 52.78. Harbhajan returned for the early 2007 ODI series against the West Indies and Sri Lanka in India, taking seven wickets at 35.87 in seven matches. Despite criticism that he feared tossing the ball up, concentrating on bowling flat in a defensive run-saving style, Harbhajan won selection as the off spin bowler in the Indian squad for the 2007 Cricket World Cup, while Ramesh Powar, who had been more expensive but had taken more wickets recently lost his spot. A statistical study showed that since the start of 2006, Harbhajan has been the second most economical bowler in the final 10 overs of ODIs. ↑ 1.0 1.1 "The renaissance of Harbhajan", BBC, November 5, 2001. Retrieved February 16, 2009. ↑ Saltau, Chloe, ""I'll be back," says the Turbanator", The Age, December 10, 2003. Retrieved February 16, 2009. ↑ New Zealand in India, 1999-2000 Test Series Averages. Cricinfo. Retrieved February 16, 2009. ↑ South Africa in India, 1999-2000 Test Series Averages. Cricinfo. Retrieved February 16, 2009. ↑ Bhattacharya, Rahul, "I'll eat anything", January 2002. Retrieved February 16, 2009. ↑ Bhattacharya, Rahul. The heart of the matter. Cricinfo. Retrieved February 16, 2009. ↑ 1st Test: India v Australia at Mumbai, 27 Feb-3 Mar 2001 Ball-by-Ball commentary. Cricinfo. Retrieved February 16, 2009. ↑ "India in downward spiral", BBC, March 10, 2001. Retrieved February 16, 2009. ↑ "Incredible India defeat Australia", BBC, March 15, 2001. Retrieved February 16, 2009. ↑ 3rd Test: India v Australia at Chennai, 18-22 Mar 2001 Ball-by-Ball Commentary. Cricinfo. Retrieved February 16, 2009. ↑ "My father would have been proud of my performance: Harbhajan", Cricinfo, March 11, 2001. Retrieved February 16, 2009. ↑ "Harbhajan waits on weather", BBC, August 2, 2002. Retrieved February 16, 2009. ↑ India in New Zealand, 2002-03 Test Series Averages. Cricinfo. Retrieved February 16, 2009. ↑ ICC Cricket World Cup, 2002/03 Bowling - Most Wickets. Cricinfo. Retrieved February 16, 2009. ↑ Bhattacharya, Rahul, "Players and Officials - Anil Kumble", Cricinfo. Retrieved February 16, 2009. ↑ 4th Test: India v Australia at Mumbai, 3-7 Nov 2004. Cricinfo. Retrieved February 16, 2009. ↑ Vasu, Anand, "Blossom in a bed of weeds", Cricinfo, Decemeber 19, 2004. Retrieved February 16, 2009. ↑ "Player of the Year nominees announced", Cricinfo, November 14, 2005. Retrieved February 16, 2009. ↑ 1st Test:Zimbabwe v India at Bulawayo, 13-17 Sep 2005. Cricinfo. Retrieved February 16, 2009. ↑ "I enjoy playing under Chappell - Harbhajan", Cricinfo, April 30, 2006. Retrieved February 16, 2009. ↑ Rajesh, S (November 11, 2005). The extras factor, and Harbhajan's return. Cricinfo. Retrieved February 16, 2009. ↑ South Africa in India, 2005-06 One-Day Series Averages. Cricinfo. Retrieved February 16, 2009. ↑ Miller, Andrew (January 17, 2006). Long live the tail. Cricinfo. Retrieved February 16, 2009. ↑ Vaidyanathan, Siddhartha, "Sehwag and Harbhajan to return home", Cricinfo, February 13, 2006 \. Retrieved February 16, 2009. ↑ England in India, 2005-06 One-Day Series Averages. Cricinfo. Retrieved February 16, 2009. ↑ Premachandran, Dileep, "Kumble bowls India to historic win", Cricinfo, July 2, 2006. Retrieved February 16, 2009. ↑ India in South Africa, 2006-07 Test Series Averages. Cricinfo. Retrieved February 16, 2009. ↑ Craddock, Robert, "Aussie bowlers no good at death", Fox Sports, February 26, 2006. Retrieved February 16, 2009. This page was last modified on 16 February 2009, at 18:34.